Last day! 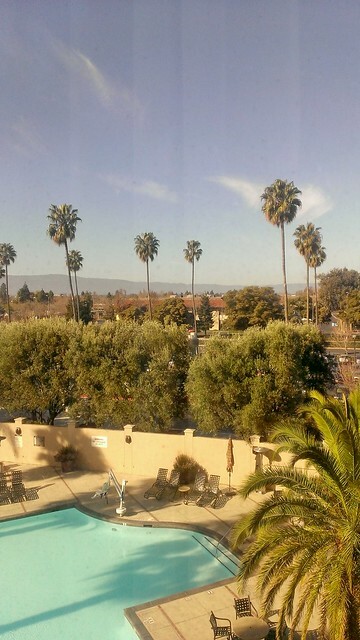 I’m sitting in the San Jose airport now, waiting to board. 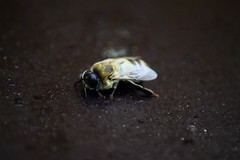 Didn’t do much today. I lounged, packed, then hit the market. Only got a couple of things. I guess nothing really grabbed me this year! 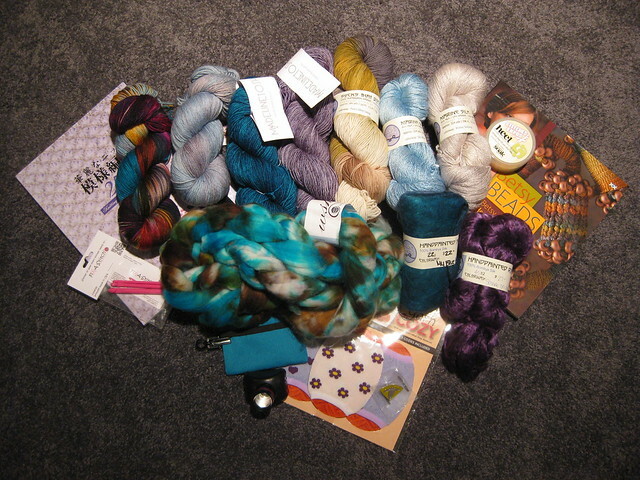 Good Stitches this year, it was great to see all my knitting friends! 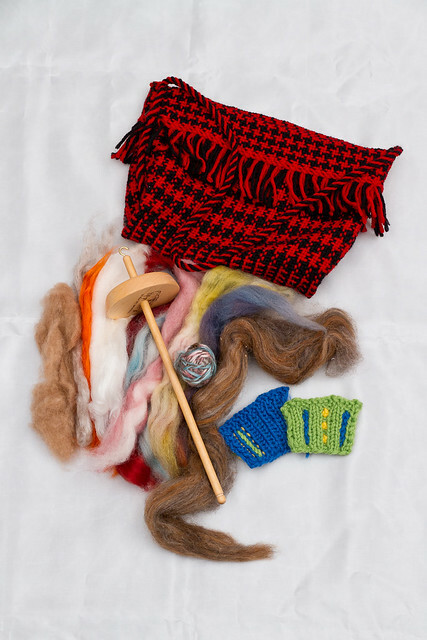 Just one class today: Tops, Locks, & Handspun with Cornelia Tuttle Hamilton. 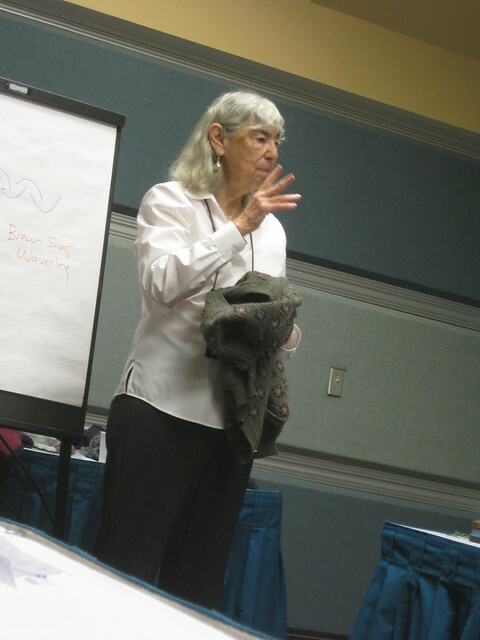 It was an interesting class about applying bits of wool and yarn to your knitting for striking effects. We just experimented with different material and techniques. Here’s my end swatch. Colorful, no? After that I went to the market, but again didn’t have time to get through it all. Last chance is tomorrow! I had a pretty low-key holiday this year, but did manage to bang out a few handmade gifts. First, a headband for my sister-in-law. 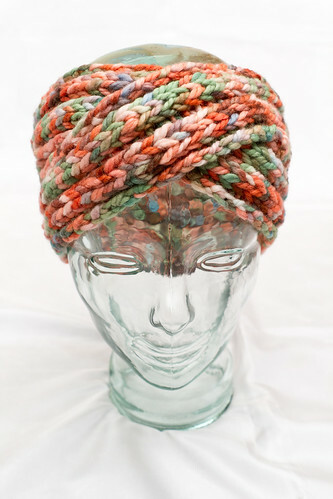 The pattern is Chunky Turban Headband by Lorna Watt, and the yarn is Sheep Shop 2. 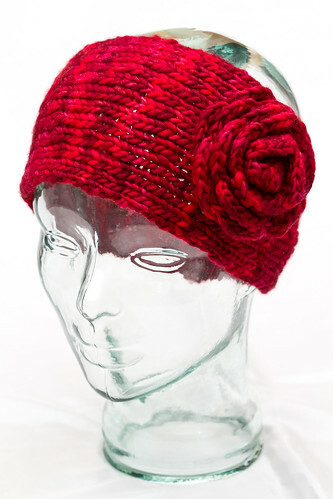 The headband thing was inspired by my mom, who wanted one of those flowered ear warmers. So I made her one. 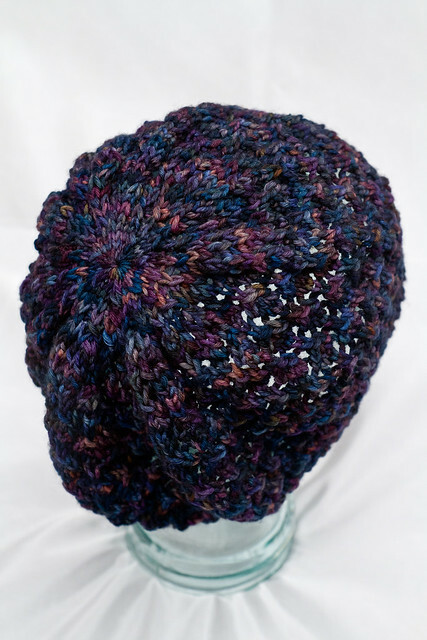 The pattern is Knit Earwarmer with Crochet Flower by Ashlee Prisbrey, and the yarn is Manos del Uruguay Wool Clasica. And then there are the nieces. I bought some Mini Mochi years ago to make them some striped gauntlets, but never got around to it. 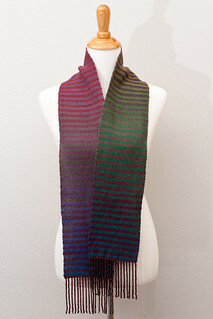 So this year I wove them striped scarves instead. 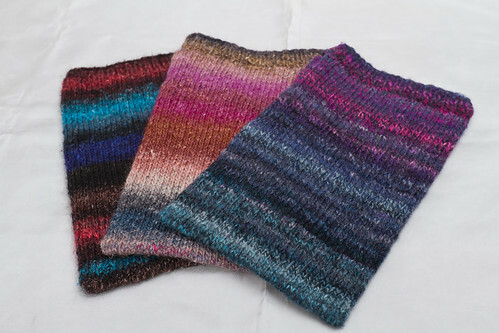 These are based on the knit Noro Striped Scarf by Jared Flood, but of course woven. 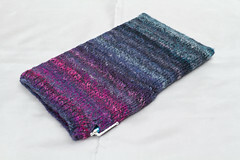 I used Valley Yarns 8/2 tencel doubled for the warp and alternating skeins of Mini Mochi for the weft. And lastly, I participated in a Top-Secret Santa gift exchange at work this year. I know this will reveal my secret identity as this person’s gift-giver, but I’ll share anyway. 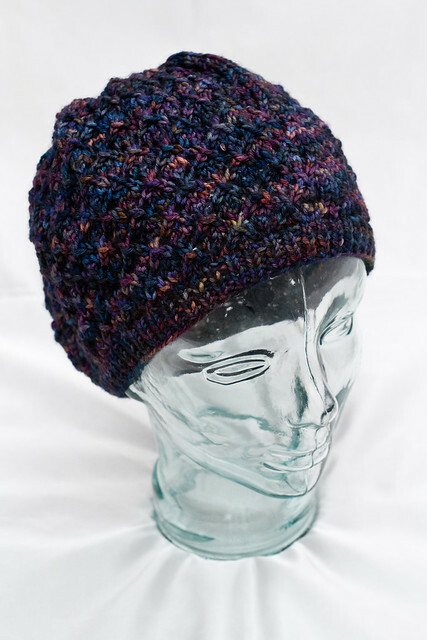 It’s a beanie using the Case of the Mondays pattern by Haramis Designs. The yarn is Three Irish Girls Galenas Chunky. That’s it! Amazing what one can do when they stop being so lazy! Things have been a bit quiet around here. I haven’t been very crafty lately, but I have had a project on the needles for the last few months. 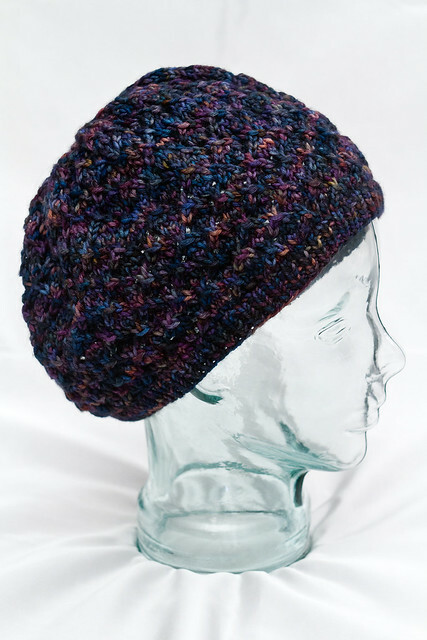 Just a hat, which I’ve just been stabbing at a few rows at a time here and there, so it took a while. Just finished it, so here it is! 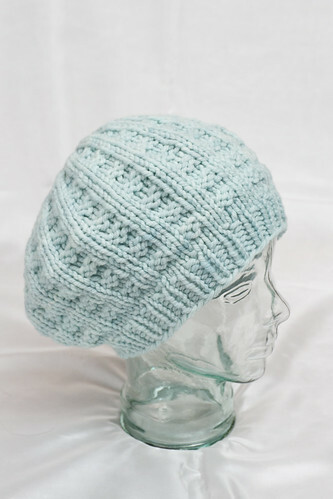 The pattern is Soft Linen Lace Beret by Meg Myers, for Classic Elite Yarns. The yarn isn’t linen, though, it’s wool. Dream in Color Everlasting DK (100% merino superwash wool) in colorway Tidewater. 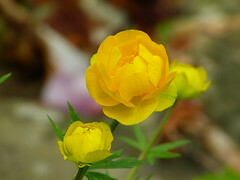 Very pretty color. The beret is on my head as I type this. Nice and cozy. Things have been quiet on the crafting front. Nice to take a break after all those Things-a-Week. 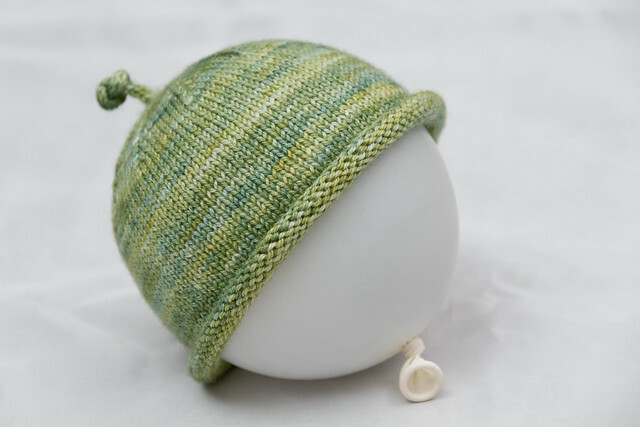 But, I did recently finish something small: a little baby hat. 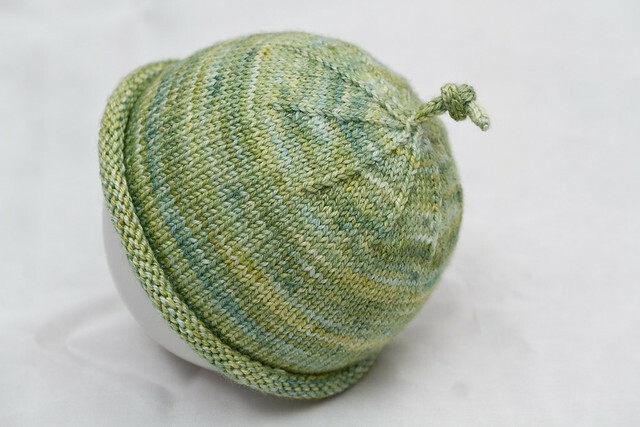 The pattern is Easy Peasy Newborn Sock Hat by Keri McKiernan, and the yarn is Pagewood Farms Yukon (70% superwash merino wool, 20% bamboo, 10% nylon) in color “Greens.” This is going to my aesthetician who’s due any day now (but not before I see her next, tomorrow!). The hat is lovely and soft and so tiny! Just something quick and cute this week. 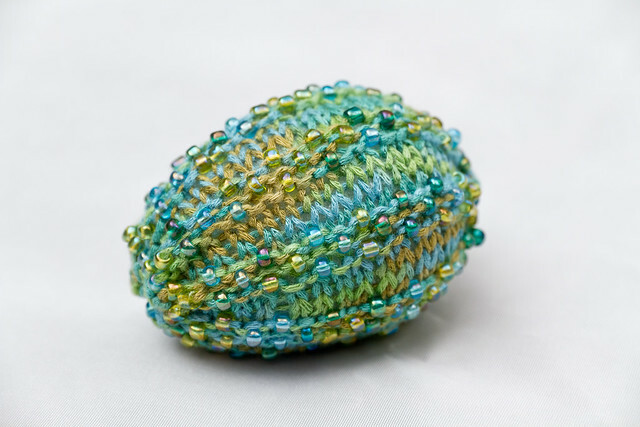 It’s a beaded Easter egg from Betsy Beads by Betsy Hershberg. I bought the book while at Stitches West and wanted to try something from it. The yarn is SWTC Bamboo and I picked up the beads cheap from Tuesday Morning. Fast and fun! Also, this is my second-to-last Thing. Hard to believe I’ve been at it almost a year! 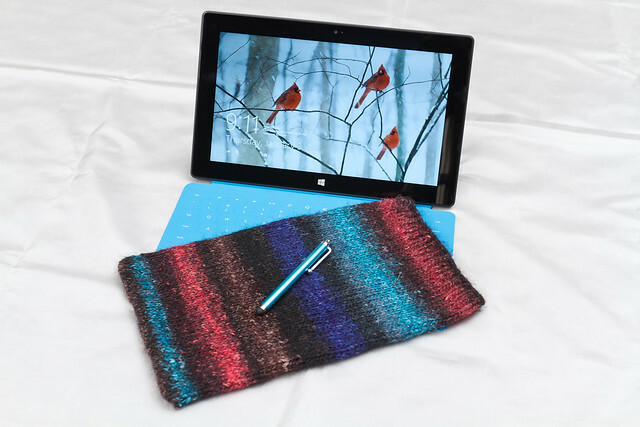 This week’s Thing is actually three things, the products of the classes I took at Stitches West. 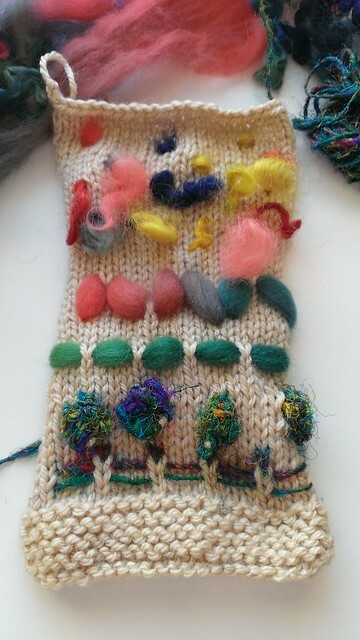 At bottom right are the samples from the Embroider Your Knitting class on Friday. Up top is the bag from the Color and Weave Mini Tote Bag class, and all that fiber and the little tiny ball of yarn is from Spinning for Knitting. My favorite, and the most proper completed Thing, is the tote bag. 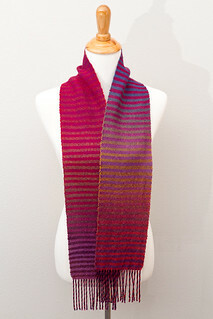 I haven’t been doing much with color patterns (or much besides scarves! 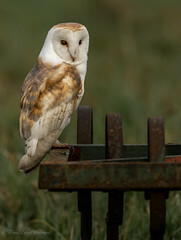 ), so it was nice to do something different. 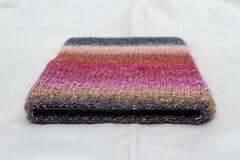 This class used a basic 2×2 alternating color warp with three different weft patterns. 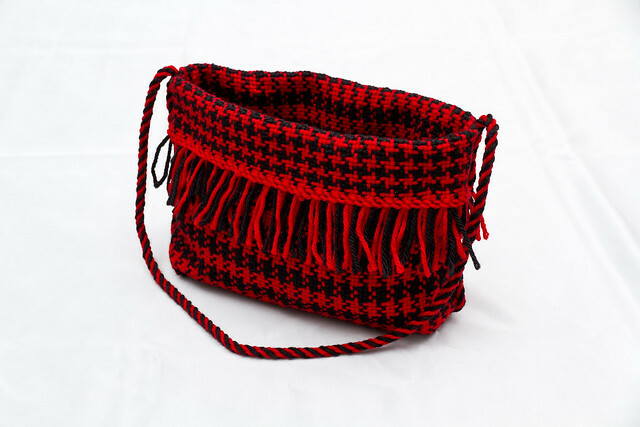 The top of the bag is one pattern (2×2), the middle is another (4×4) and the bottom is yet another (1×1). 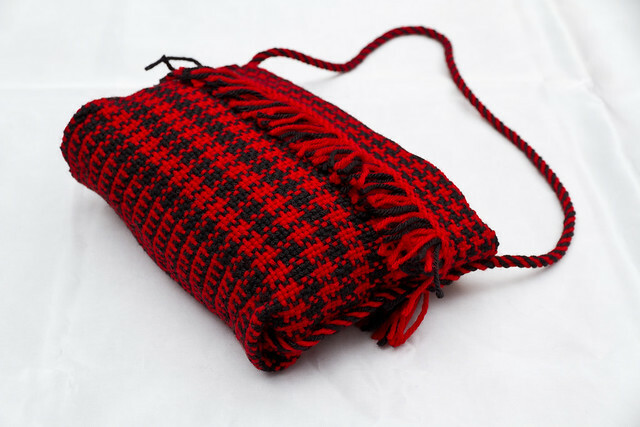 It’s pretty neat to see the different effects you get by just varying the weft. Overall, the classes were great and I learned a lot. Looking foward to next year! I had the best of intentions. Honest. 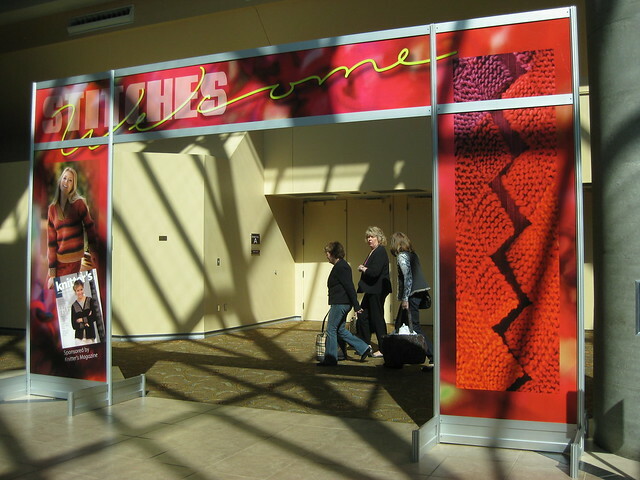 I was going to post daily accounts of my time at Stitches West, like I did last year, but the days were so packed that I didn’t have the time. So, here’s a recap! Stitches West began on Thursday. 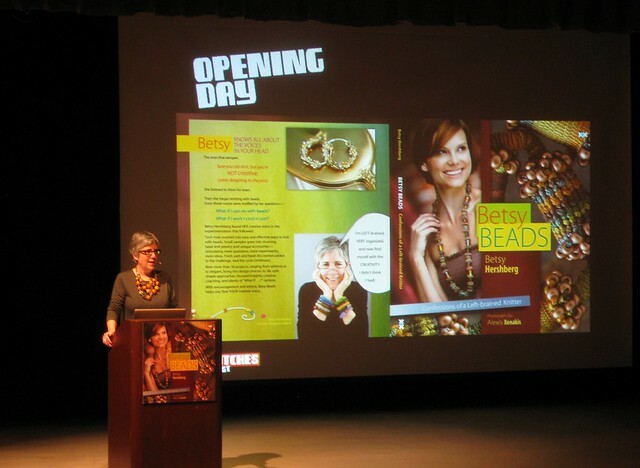 I went to the opening session by Betsy Hershberg, author of Betsy Beads. XRX, who runs the show, is promoting the book. I’d gone in not really interested in it, and by the end of the speech, I wanted to purchase the book (and did!). Funny how that works. Nice job, XRX. After the session was lunch, where the teachers came around to our tables at five-minute intervals. It was a great chance to see what was being offered at Stitches. While there were classes Thursday afternoon, I didn’t sign up for any, choosing instead to hang out and wait for the market preview to open. I did take three classes at Stitches. 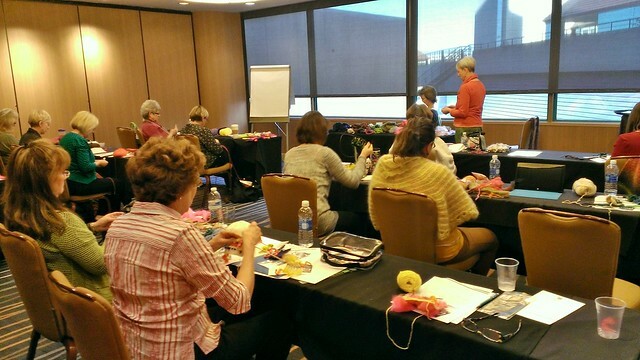 My first was a three-hour class on Friday: Embroider Your Knitting with Anna Zilboorg. Amazing lady, beautiful work. I sincerely hope she comes out with a book on the techniques in the class. 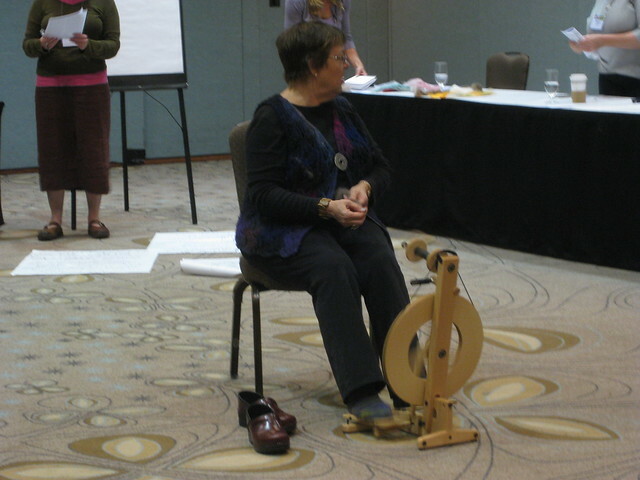 Finally, I had a class on Sunday morning: Spinning for Knitting with Merikke Saarnit. I already spin, but this class was worthwhile to gain a better understanding of different fibers and techniques. I purposely didn’t fill my schedule with classes. I’m fortunate to have fallen in with a group of great folk from Northern California and enjoyed spending time hanging out and knitting with them. 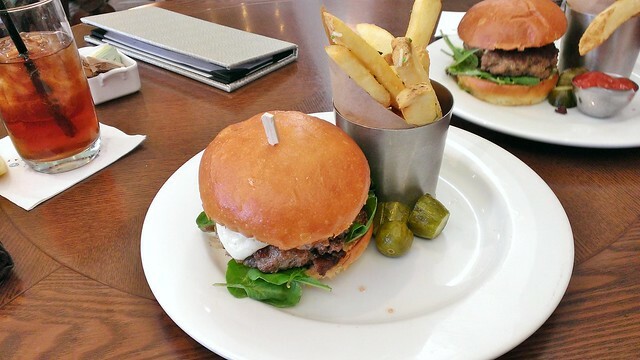 I also met with relatives for dinner on Saturday and spent an afternoon with a high-school friend on Sunday before my flight home. 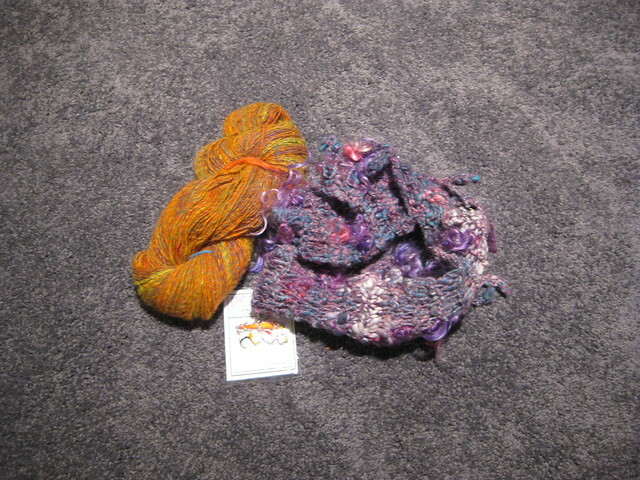 Oh, and my roomie Sherry bestowed upon me a beautiful skein of yarn that she spun and a knit cowl. What great friends I have! The rest of my time was spent at the marketplace, which was pretty awesome, as usual. 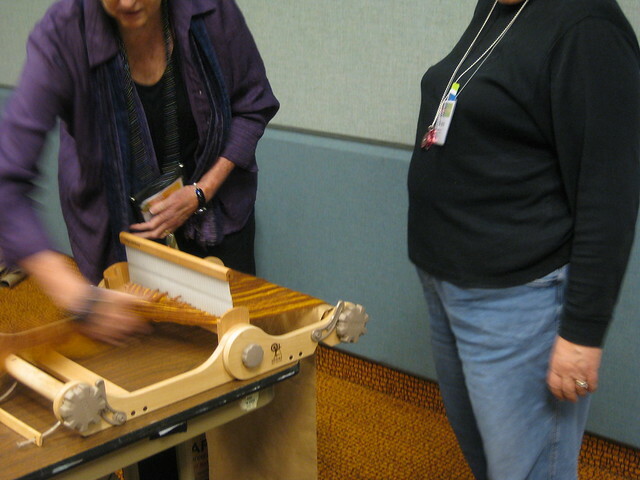 Nearly 200 vendors, thousands and thousands of yarns and books and other goodies. It’s a wonderland. I didn’t get that much, considering how much there was to buy. That’s pretty much it. It’s all a blur, and I didn’t get much sleep, but it was great. Definitely want to go again next year!